Tempo Ultra WSP Insecticide is used for broad-spectrum control targeting a variety of flying, crawling, and wood-infesting pests that are both indoor and outdoor. Great for use on residential, commercial and ornamental landscapes. Tempo Ultra WSP Insecticide will kill pests on contact and will kill up to 30 days. Each box contains 8 packets. Each 50g water-soluble packet of Tempo Ultra WSP Insecticide should be diluted in 2.5-5 gallons of water. For equipment that holds less than 2.5 gallons of water, consider the larger tub of Tempo Ultra WP. Check label directions for target pest and application needs. Outdoors: 1 packet treats up to 10,000 sq. ft.
Tempo Ultra WSP Insecticide uses Water Soluble Packets to house a powder concentrate that is diluted with water and applied with a sprayer. The water-soluble packets eliminate the need to measure loose concentrate before mixing, making the product extremely simple to apply. Tempo Ultra WSP contains the active ingredient cyfluthrin, a synthetic pyrethroid that attacks the central nervous system of target pests. Though Tempo Ultra WSP is tough on insects, it is very gentle on people and pets when used correctly. Tempo Ultra WSP kills insects contacted with the direct spray or with the residual after it dries for 30 days or more. Tempo Ultra WSP Insecticide is labeled for broad-spectrum control of crawling, flying, and wood-infesting pests on indoor and outdoor surfaces, as well as insect pests of trees, landscape ornamentals and residential and commercial lawns. 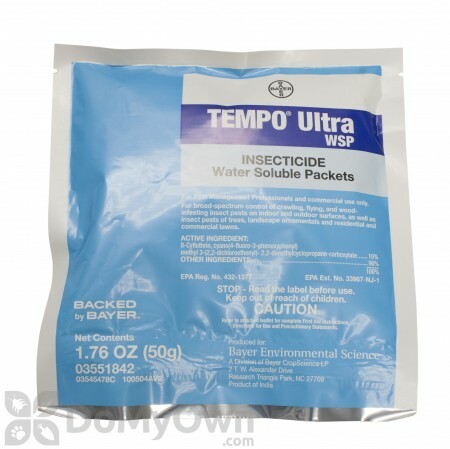 Tempo Ultra WSP Insecticide is a pre-measured water soluble packet to be diluted in 2.5 to 5 gallons of water for most application, or for up to 100 gallons of water for ornamental pest applications. The wettable powder formulation and high concentration of cyfluthrin make Tempo Ultra WSP ideal for tough pests like scorpions and spiders, as well as applications to porous surfaces such as concrete. Unlike many other wettable powders, such as Demon WP, Tempo Ultra WSP is labeled for a wider variety of turf, landscape, and ornamental pests, meaning it is gentler on plants than other wettable powders. The packaging of Tempo Ultra WSP is convenient for small or one-time applications. Apply Tempo Ultra WSP where listed pests have been seen or found or can find shelter, such as in and around buildings and structures, on residential, commercial and recreational areas of turf, and on ornamentals in landscapes and interior plantscapes. Apply as a general surface spot, mist, or crack and crevice application, or as a broadcast application to turf and foliar application to ornamentals. The inner packet contains Tempo Ultra WSP and dissolves in water. To prepare the spray mixture, drop the unopened inner packet into spray tank while adding water. Operate the agitator while mixing. Depending on water temperature and agitation, the packets will dissolve within a few minutes from the time they are added to the water. Diluted may be stored overnight. Agitate before using. Each single packet treats up to 10,000 square feet outdoors or makes up to 5 gallons of finished spray solution for indoors. Apply where pests have been seen or found, or can find shelter. Use a general surface, spot, mist, or crack and crevice application. For sprays, use a low-pressure system (less than 50 psi at tip). This product can be converted to a foam. Re-apply every 7 to 10 days if needed. Do not treat entire areas of floor or floor coverings or use as a space spray. Do not apply to furniture or upholstery where prolonged contact by humans will occur. Use a coarse, low-pressure spray and treat entry points such as around water pipes, doors, windows, and eaves. Treat areas where pests normally feed or hide such as baseboards, corners, around water pipes, under refrigerators, cabinets, sinks, and stoves, being sure to spray cracks and crevices. Spot treat floor or rugs beneath furniture, in closets, and storage areas, but do not apply to entire floor area. Apply were pests have been seen or found or can find shelter. Apply to buildings, porches, patios, garages, fences and other areas where pests are found. To prevent infestation, treat the building foundation, walls, and around doors, windows, and soffits, where pests are active or may enter or hide; also treat the soil, turf, and other substrates adjacent to buildings. Treat a band adjacent to buildings up to 10 feet wide. Also treat the building foundation to a height of 2 to 3 feet in areas where pests are active or can find entrance. If mulch is heavy, rake it back to expose soil before treating. Make a perimeter treatment, concentrating on areas where pets rest or run. For ticks, treat likely harborage areas like along paths, tall grass and other vegetation. For best results, treat the entire area where ticks could be present. Begin treating in the spring. Ticks may be re-introduced from surrounding areas by host animals. Continue treating until frost to control both larvae and adult ticks. For turf application for ticks, treat the entire are where ticks could be present for best results. For use on landscape and recreational turfgrass only. Apply when pests first appear. Reapply as needed based on pest reinfestation, but do not treat more than 6 times per year. Use a 50 g packet in adequate water to cover 5,000-10,000 sq. ft. depending on pest and infestation level. For Chinch Bugs, water the turf immediately after application. For armyworms, cutworms, and sod webworms, do NOT water or mow for at least 24 hours following application. Apply where pests are seen, have been found, or can find shelter among trees, shrubs, evergreens, ground covers, flowers, and foliage plants. No phytotoxicity has been observed on a wide range of ornamentals tested under various environmental conditions. If in doubt, first try this product on a small sample. Use 1-3 packets per 100 gal. of water. Use higher rate for severe infestations, faster knockdown, and longer residual. For hard-to-wet foliage such as holly, pine, or ivy, adding a spreader sticker may enhance knockdown and residual activity. For best results, spray thoroughly for good coverage including the underside of leaves for pests that feed or rest there. May be tank mixed with commonly used fungicides, miticides, liquid fertilizers and other insecticides registered for similar uses. product works fantastic.. dead bugs every where.... But I was especially very happy with the price and the very easy, user friendly layout of this website..
Read the instructions carefully and do not forget to wear a face mask. Last year I spent around $150 to have wasp controlled by pest control. One package of the Tempo Ultra WSP and they are gone. First time using Tempo to treat for roaches. Definitely recommend this product for anyone having issues with pest. Great service and fast shipping. Product works well, maybe very well. But, the packaging is a challenge and the user must be careful not to in-hail any of the powder as one tries to scoop out the powder from its bag on windy days. Powder does travel even with slit wind Be careful. open bag downwind from body position. How long does Tempo Ultra WSP continue to kill after the initial spraying? Tempo Ultra WSP will continue to erradicate listed insects for up to 30 days. How effective is Tempo Ultra WSP Insecticide at killing Bed Bugs? I have a small bed bug infestation. 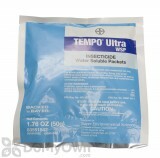 Tempo Ultra WSP Insecticide is labeled for bed bugs. Apply where pests have been seen or found, or can find shelter. Use a general surface, spot, mist, or crack and crevice application. For sprays, use a low-pressure system (less than 50 psi at tip). This product can be converted to a foam. Re-apply every 7 to 10 days if needed. Do not treat entire areas of floor or floor coverings or use as a space spray. Do not apply to furniture or upholstery where prolonged contact by humans will occur. You will use 1 packet in at least 2.5 gallons of water. Does Tempo Ultra WSP Insecticide come with a spray? Tempo Ultra WSP Insecticide is a dry formulation that is mixed with water and applied using a hand pump sprayer (not included). We also carry Tempo SC Ultra which is a liquid formulation Please provide more detailed information and we will gladly assist you. Can Tempo Ultra WSP be used on powder mixed with maybe DE? I want a longer residual for bedbugs. Can I mix with DE and spray it without water? Tempo Ultra WSP should only be mixed with water and applied to indoor crack and crevices. It is labeled for bedbugs but should not be the only product used for a bedbug infestation alone. First, using powders or dusts alone will not effectively get rid of a bedbug infestation. Insecticide dusts and powders take about a week to actually kill insects and in that time the bedbugs can still bite and reproduce. We offer bedbug kits that contain all of the different products you need to eliminate bedbugs and retreatments should be done every 7-10 days until you do not receive a bite for 30 days. Most dusts only need to be applied once every few months and unless you vacuumed. We also highly recommend using mattress and boxspring encasements to help eliminate bedbug infestations. These bedbug proof covers will trap existing bedbugs and eliminate hiding places and make inspections easier. Can Tempo Ultra WSP Insecticide be mixed with NyGuard EZ1? Can these two products be mixed together to create an effective indoor adulticide/IGR? Yes, you can mix both Tempo Ultra and Nyguard together with water.